Even if you don’t follow basketball you know his name. Yao Ming is one of the tallest basketball players to ever grace the NBA. At 7 feet and 6 inches, he was the tallest active player in the NBA during his final seasons of play. He towers over many, inside the league and out, and has always stood out as a tall athlete with the height to go the distance. He’s the honoree in today’s Tall of Fame! 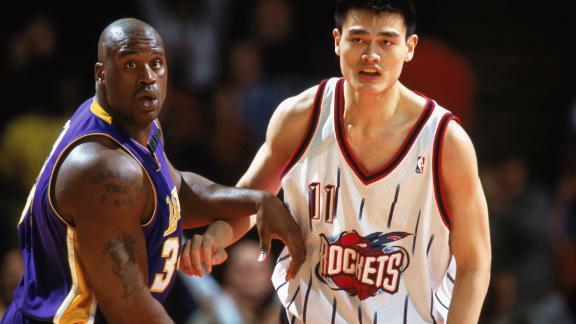 Yao was born tall. He was nearly double the size of most Chinese babies at birth, largely in part due to his very tall, professional basketball playing parents (both over 6 feet tall). In China, the average male is 5 feet 6 inches tall so he clearly surpassed that height at young age – 9 years old. Around that age he started playing basketball, and a few years later he was playing for the junior team in the Chinese Basketball Association. After playing in the CBA for 5 years in the senior league, he declared for the NBA draft and went as a first round draft pick to the Houston Rockets. He was the very first international player to be drafted in the NBA without playing any college basketball in the United States. He was the second Chinese player to be drafted out of the CBA into the NBA. He served as a bridge between American and Chinese sports enthusiasts. Yao Ming was an accomplished player, with 8 NBA All-Star seasons, 5 times on the All-NBA team, Olympic and World game teams, and induction into the Naismith Memorial Basketball Hall of Fame last year. He participated in the 2008 Olympic Ceremonies, carrying the Olympic Flame into Tiananmen Square, carrying the Chinese flag, and playing well in the Olympic Games despite China’s losses. He retired in 2011 after troubling injuries which plagued his later years in the league. He suffered injuries to his toe, both feet, a knee, and more, which lead to extended period on the disabled list and a few surgeries. Many question where Yao Ming’s future could have ended up had he been able to avoid these injuries. Yao Ming is a well-known and well-respected basketball player and international figure. He’s featured in documentaries and biographies, as well as plenty of highlight footage from his years in the NBA and CBA. We’re proud to add Yao to our Tall of Fame – some incredible people who are particularly blessed with height and maybe in need of our tall slim tees. Big and Tall aren’t the best for everyone, and if you’re like Yao and sick of tees being too short or too wide for you, our Tall Slim Tees are the answer.